Personalize learning with MyLab Math. NOTE: This package includes a MyLab Math access kit created specifically for Hass/Heil/Weir, Thomas' Calculus: Early Transcendentals 14/e. 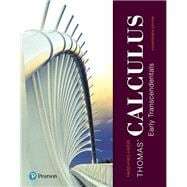 This title-specific access kit provides access to the Hass/Heil/Weir, Thomas' Calculus: Early Transcendentals 14/e accompanying MyLab course ONLY.